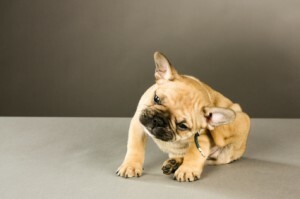 Chances are that if you have a pet, your pet has had fleas at least a few times. And if your pet has had fleas, you know just how miserable it can be for them: constant scratching, itching, biting, and rolling around, all to try to get rid of those tiny little biting insects. Fleas are wingless, with hard bodies that make them difficult to kill, and they have mouths adapted for piercing the skin of their “victims” and sucking out their blood. They are nasty little critters that can make life pretty annoying for your favorite furry pet. As we know, the local pet store sells plenty of toxic products designed to kill those fleas dead in no time. But if you are busy trying to protect yourself from toxic chemicals, why not try to do the same for your cat or dog? The chemicals usually found in flea meds – lufenuron, methoprene, imidacloprid, permethrin, and (S)-methoprene – are quite toxic to humans and come with warning labels. The labels say “call a poison control center for treatment advice” which says to me that these products can’t be all too healthy to apply all over your pets. Thankfully for us pet owners, there are safer alternatives and some behaviors we can implement to help keep our best friends flea and scratch free. They may not like it, but combing your cat or dog regularly helps remove fleas, dead skin, dandruff, and crusty blood spots. Rinse the comb often as you use it, to send those fleas down the drain and off the animal! If your pet has a favorite spot in the yard to hang out, keep it dry, cleaned up and cut short. This can help keep the flea population down. Wash your pet’s bedding often. Use hot water with soap, and wash often to help kill those fleas. I use food grade diatomaceous earth all over my house, inside and out, for keeping ants and cockroaches at bay. It is an amazing substance made from the fossilized remains of marine phytoplankton. I sprinkle it around the foundation every month or so as well as put it in the back of my kitchen cabinets and under the sink. It seems to work well, and it works for killing fleas, too. Some people actually use it on directly on their animals, but I haven’t done that yet as it can be dangerous if inhaled directly. Give your pets baths as often as they (or you) can stand to do so. Use Dr. Bronner’s soap to make sure your pet isn’t replacing a toxic flea med with a toxic soap! Good old fashioned baking soda. Some people use it to unclog drains or make their fridges smell better, but it can also be used to kill fleas by dehydrating them. Fleas love warm, wet areas, and by keeping your home drier you can somewhat reduce the amount of flea eggs that survive to adulthood. The next time you see your cat or dog scratching furiously because of fleas, consider trying a nontoxic alternative to those chemical bombs normally sold in pet stores. If none of the natural tips work, don’t feel too bad about using a store bought solution though; after all, we do want our pets to be comfortable, right? Great post! We have been having flea problems because of the hot weather lately. It gets so annoying and I feel so bad for the pups. Luckily, it has never gotten bad, just one or two on them. I have heard that they peak in the summer.. At least you can treat them outside when it is not too cold. The humidity has the fleas here breeding like crazy, but we’re managing to keep them under control. I feel bad too when I see the pets scratching! Interesting post. Bathing our pet is very necessary, but we must make sure not to bathe them as often as we want, since pets are different from human and it might prove to be more dangerous than beneficial to them. I have read that. Apparently you can cause rashy and itchy skin and hurt the oils in their coat if you wash them too much. I’ve heard that from a close friend who has a Labrador. It initially made me raise an eyebrow, though. Well pets need us to look after them. They can’t treat themselves for fleas and they can drive a poor puppy nuts. I usually mix in a little bit of garlic in their food. It’s supposed to help keep fleas away. I realize there is a huge debate on whether or not garlic is safe for dogs but our little guys seem fine and I’ve been doing it for a while.